Lower Calf Creek Falls is one of the region’s top attractions. It is reached by a 2.75 mile trail from the Calf Creek Campground. Slightly uphill and rather sandy, the trail is moderately strenuous but highly worthwhile. It features colorful canyon walls, Indian rock art, a lush stream bed, and the 126-foot falls. Upper Calf Creek Falls can be reached by a strenuous hike from Utah-12 (trailhead is 22.3 miles from Escalante). The 13-site campground is a lush (but buggy), wooded oasis along Calf Creek which is usually perennial. Arrive very early in the day if you want to try for a site here. The turnoff from Utah-12 is very scenic, just north of the one-lane bridge crossing the Escalante River. The vista includes the highway starting its climb up the Hogback to Boulder with huge, colorful ridges in the background. Visit time: the hike to the lower falls and back is 3 hours. An overnight stay would allow for some interesting day hikes from the one-lane bridge. The Escalante River is usually very shallow and amenable to hiking, either by wading in the river or picking your way along the embankments. Escalante Natural Bridge is two miles upstream (heading west from the bridge) on south side of the river. Phipps Wash is a mile downstream (watch for detour around private property). The wash features Phipps Arch and Maverick Natural Bridge in side drainages. The heart of the Grand Staircase Escalante National Monument is the Escalante River and its many tributaries. The normally low water levels in the river and its side creeks allow a tremendous number of hiking options in a sandstone world. You will find slot canyons, arches, natural bridges, waterfalls and more. Due to the distances, the canyon system is generally suited for longer backpacking trips. The most popular hike is perhaps Coyote Gulch with entry from Hurricane Wash. The beautiful canyon contains two arches, a natural bridge, and several waterfalls. The hike to the Escalante River and back takes about three days. Permits are required for all overnight stays, and may be obtained at the Escalante Visitor Center. For those with less time, the narrow slot canyons off of the Dry Fork of Coyote Gulch (12a) have become very popular. These can be explored in a long day. The access road is off of the Hole-in-the-Rock Road at mile 26. A trail leads into the canyon. Heading downstream, the three immediate side canyons are the Narrows (easy walking), Peek-a-Boo Gulch (climbing and scrambling), and Spooky Gulch (easy but extremely narrow). Our experience: We parked our vehicle at Hurricane Wash, then were driven to the Harris Wash trailhead. The plan was to hike the Escalante River downstream, then exit at Coyote Gulch and out Hurricane Wash. Upper Harris Wash was quite fouled with cattle grazing but became an excellent sandstone canyon downstream where we found a nice alcove for camping. The Escalante River Canyon was much wider, still with huge sandstone walls. Due to spring runoff, the river was very deep (thighs) and fast, making hiking extremely strenuous. The riversides are frequently clogged with non-native vegetation (like tamarisk) which makes it difficult to avoid the river. We did explore Fence Canyon (old rancher’s cabin), Twenty-five Mile Canyon (steep sheer walls), and Moody Creek (lots of petrified wood) before exiting early at Scorpion Gulch due to the difficulty of hiking in the river. Scorpion offered interesting challenges with a climb around a large waterfall and pool and negotiating two enormous sand dunes. The return to the vehicle across the surreal slickrock terrain was fascinating as well as challenging. Precise map and compass navigation was required to find the break in the cliffs in order to get across Coyote Gulch. Visit time: a long day or a week or more. If you are a self-sufficient backpacker, there are many opportunities to avoid the popular hikes and enjoy a wilderness-like experience. Dry Fork of Coyote Gulch including the slot canyons. The road is paved except for the section in Capitol Reef National Park and just east. High clearance vehicles are suggested on the dirt section which may be impassable during wet weather. Trailers are not advised due to the tightness of the switchbacks. If you take any side trips off the main road, high clearance is strongly advised, and four wheel drive may be needed in some cases (see NPS guide below). 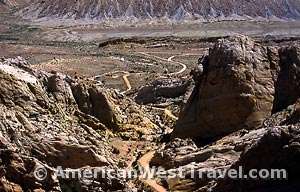 The Wolverine Loop Road (15a, Route 110) accesses the Wolverine Petrified Forest (second largest in North America) and several of the Escalante River’s remote east-side tributaries. Both the driving (high clearance 4WD suggested) and the hiking (obstacles, route finding skills needed) can be challenging is this area. Big Water Visitor Center – South side of road across from the town of Big Water, Utah which is 18 miles north of Page, Arizona. Small visitor center with excellent interpretive displays pertaining to dinosaur discoveries. Has a spectacular 40′ x 7′ wall mural. The Toadstools – Easy, one-mile hike to a very colorful valley featuring toadstools, rock spires with a loose, balanced rock cap – a bizarre erosional phenomenon. Unsigned trailhead (look for a parking area with bulletin board on the north side of the road) is 12 miles west of Big Water, 1.5 miles east of the Paria Contact Station. Wahweap Hoodoos – Even more exciting and colorful hoodoos and toadstools can be seen on this moderate hike (4.3 level miles each way) that starts a few miles north of Big Water and heads up Wahweap Creek Wash. Download this improved PDF version of the official handout. Catstair Canyon – Small canyon containing exciting rock art, some of which is thought to be 6,000 years old. Look for gated (but unlocked) dirt road on south side of highway just east of House Rock Valley Road and about three miles west of Paria Contact Station. Drive through gate (and then close it) and proceed to a small parking area. Follow the trail into the wash which soon becomes a sandstone gorge containing the rock art.